Come and discover the history of the company Ferrari Formaggi. From the origins of the dairy farm till today: the story of a tradition that reinvents itself. All the information about the dairy production of the company. Discover how we select the raw materials to offer you high quality products with a unique taste. Thanks to the Ferrari family’s extensive experience, great traditional Italian cheeses are chosen at the right point of maturation, bringing a unique taste experience to tables around the world. Ferrari at Cheese 2017: taste, surprises and excellence. We invite you to visit us in Cheese! We invite you to visit us in Cheese!. Ferrari Formaggi at the forefront of promoting Made in Italy Food internationally. Ferrari brings the excellence of cheese to Vinitaly. Come and taste our Parmigiano Reggiano “Prodotto di Montagna Progetto Qualità"! Ferrari brings the excellence of cheese to Vinitaly. Come and taste our Parmigiano Reggiano “Prodotto di Montagna Progetto Qualità"!. 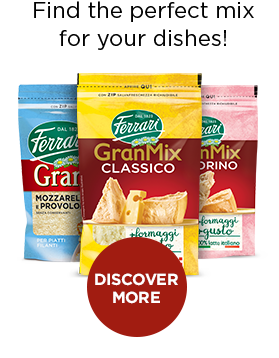 Expertly combining the best cheese-making traditions to create the unique taste of GranMix! Expertly combining the best cheese-making traditions to create the unique taste of GranMix!. Ferrari Formaggi at Cheese 2015. A gold medal for Ferrari Grana Padano Riserva at the International Cheese Awards, Nantwich. The Ferrari sisters were interviewed by We Women for Expo. Giovanni Ferrari Grana Padano Riserva was found to be the best on the german market. Ferrari selects and imports only the best Swiss dairy products.